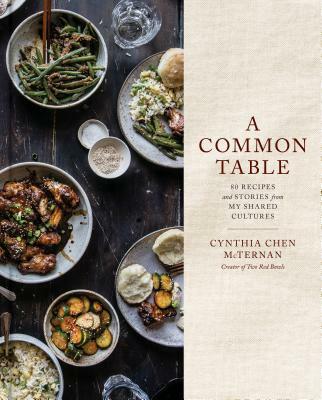 In A Common Table, Two Red Bowls blogger Cynthia Chen McTernan shares more than 80 Asian-inspired, modern recipes that marry food from her Chinese roots, Southern upbringing, and Korean mother-in-law’s table. The book chronicles Cynthia’s story alongside the recipes she and her family eat every day—beginning when she met her husband at law school and ate out of two battered red bowls, through the first years of her legal career in New York, to when she moved to Los Angeles to start a family. As Cynthia’s life has changed, her cooking has become more diverse. She shares recipes that celebrate both the commonalities and the diversity of cultures: her mother-in-law’s spicy Korean-inspired take on Hawaiian poke, a sticky sesame peanut pie that combines Chinese peanut sesame brittle with the decadence of a Southern pecan pie, and a grilled cheese topped with a crisp fried egg and fiery kimchi. And of course, she shares the basics: how to make soft, pillowy steamed buns, savory pork dumplings, and a simple fried rice that can form the base of any meal. Asian food may have a reputation for having long ingredient lists and complicated instructions, but Cynthia makes it relatable, avoiding hard-to-find ingredients or equipment, and breaking down how to bring Asian flavors home into your own kitchen. Above all, Cynthia believes that food can bring us together around the same table, no matter where we are from. The message at the heart of A Common Table is that the food we make and eat is rarely the product of one culture or moment, but is richly interwoven—and though some dishes might seem new or different, they are often more alike than they appear. Cynthia Chen McTernan is a lawyer and the self-taught home cook and photographer behind Two Red Bowls, winner of the 2015 Saveur Blog Award for Most Delicious Food. She has been featured in Food & Wine, Saveur, Better Homes and Gardens, Good Housekeeping, and Huffington Post, and has collaborated with West Elm, Crate & Barrel, King Arthur Flour, Food52, Urban Outfitters, and more. Cynthia graduated from Harvard Law School in 2013 and spent three years at a law firm in Manhattan before moving to Los Angeles, California, where she continues to practice law—when not cooking—and where she lives with her husband, the patient taste-tester and the original owner of the two red bowls, and their baby, Luke.